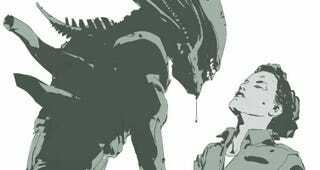 Alien: Isolation is a pretty great game, but aside from the whole terror thing, one of the best things about it is the attention to detail and adherence to the original film's aesthetic. Knock, knock. Who&apos;s there? An alien. It kills you. You can thank Creative Assembly's art team for that, as they got access to much of the 1979 movie's creative documents and did a fantastic job bringing that vision into the game. The pics you see below, mostly from Isolation's pre-production concept art (though there's some marketing stuff here as well) are the work of artists Calum Watt, Bjorn Hurri, Bradley Wright, Stefano Tsai (all of whom have been featured here on Fine Art previously) and the game's AI art team. If you dig what you see, the game's actually got an art book that was released earlier this month that contains these and around 290 other images.